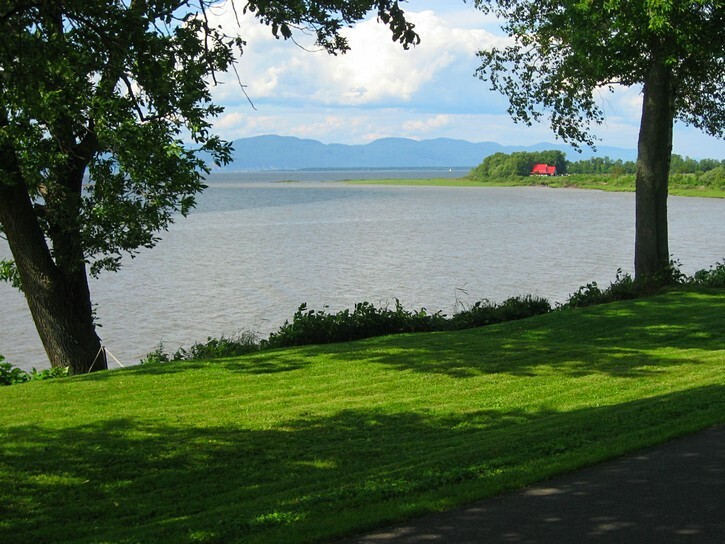 Cycling from Quebec City to Montmagny would be a good introduction to that part of Quebec’s “Route Verte” which runs along the St. Lawrence River towards Gaspe. 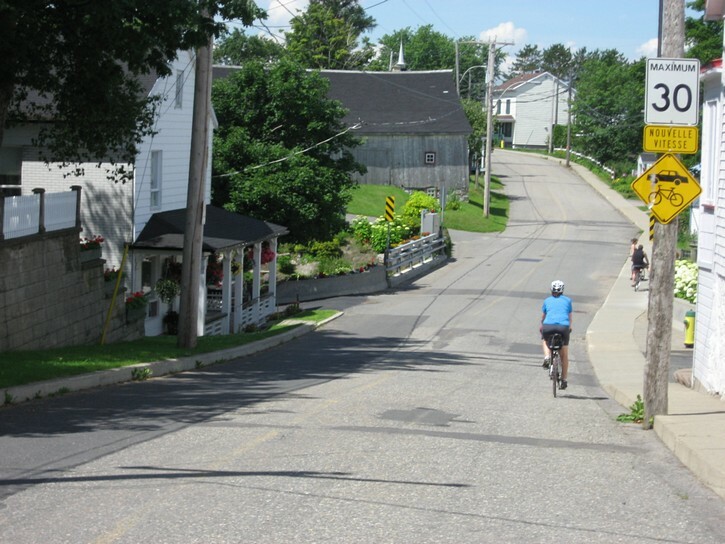 This ride will provide a number of great vistas of the river and surrounding landscape, and it will pass through several communities that seem to exemplify the small towns you’ll find in this part of Quebec. Depending on your starting point, it will cover 50 to 60 kilometres (one way). 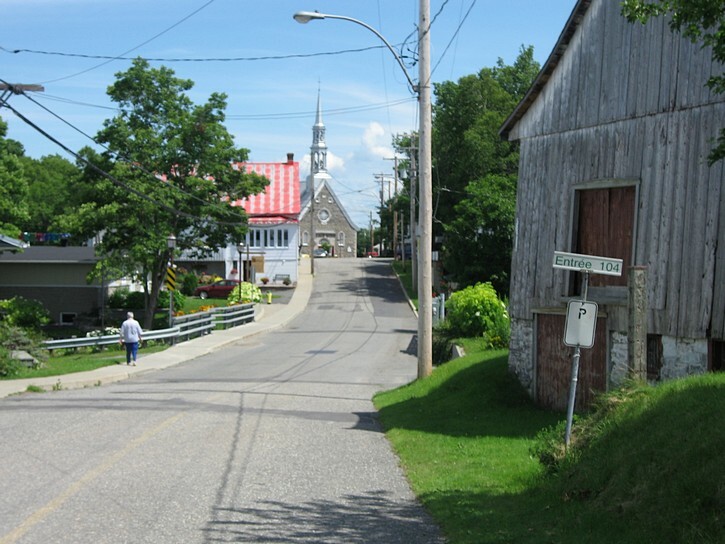 The destination will be Montmagny, a medium size town with a population of a little over 10,000. 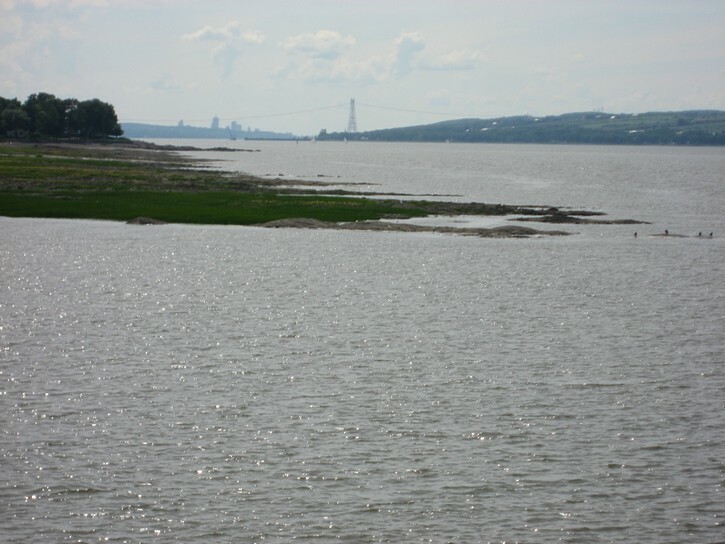 It is located down river from Quebec City on the south shore of the St. Lawrence. Although it is not an overly touristy town, it has everything needed for a comfortable overnight stay, including two very nice inns. 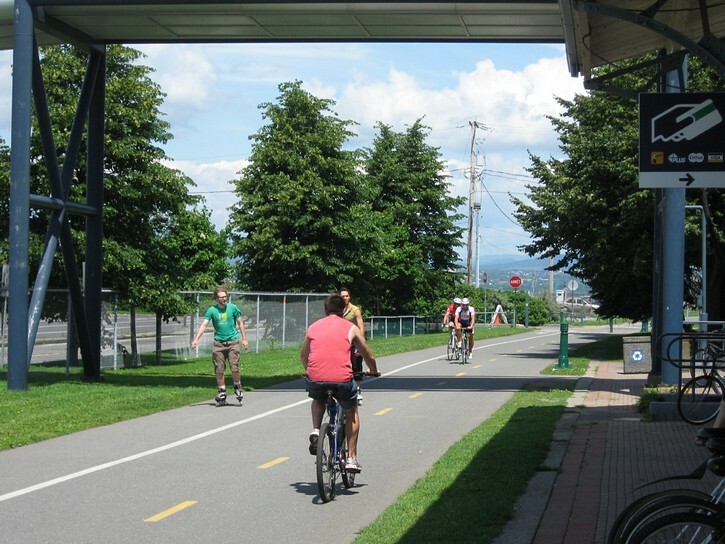 The first part of the ride will be on bicycle paths, but most of it will take place on the paved shoulder next to a secondary highway (the 132). 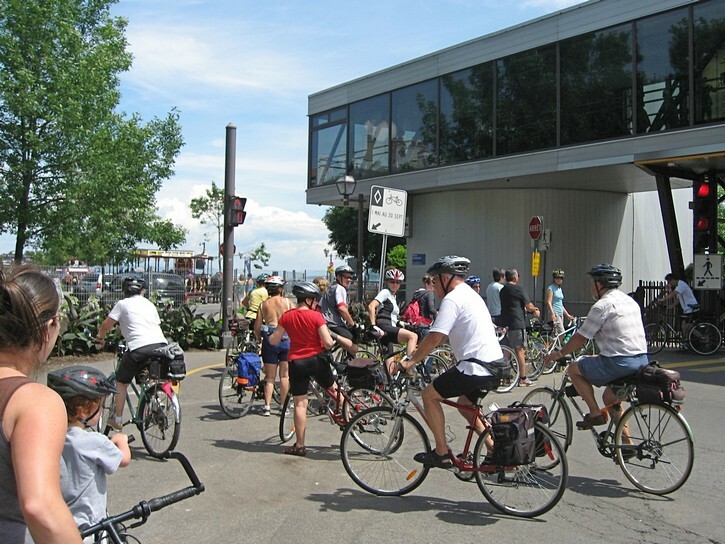 This route is also an official part of the Route Verte bicycle network. There are a number of areas where there are long slopes, some of which are steep enough to qualify as real hills. This could be problematic for people who have zero tolerance for any kind of hills, otherwise it shouldn’t be too much of a challenge for the average recreational cyclist. One thing that should be taken into account when planning this ride is that you’ll probably have the prevailing winds at your back when going to Montmagny. Conversely, this also means that you’ll likely have the wind on the nose for the return trip. 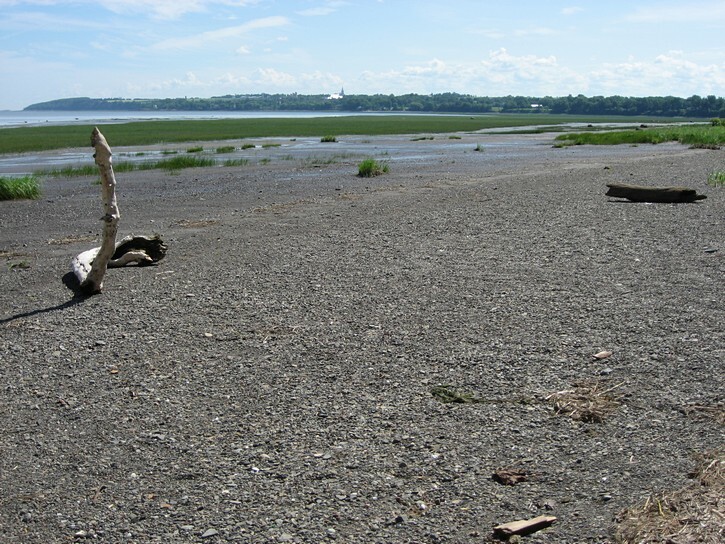 It should be noted that while this route follows the St. Lawrence River, it does not run right next to the water’s edge. 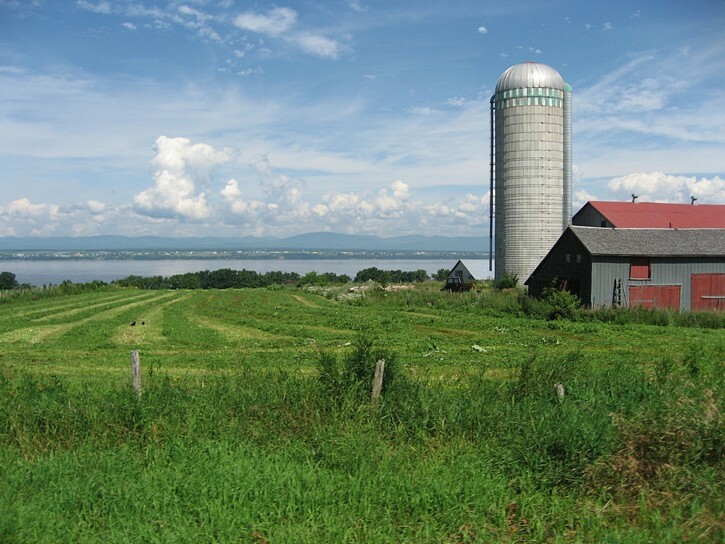 You often have the St. Lawrence in full view, and access to the waterfront in a number of areas, but there will be a strip of farm land or residential properties separating you from the river for most of this ride. You should also keep in mind that although there are a handful of restaurants on this part of highway 132, the selection is not overwhelming. 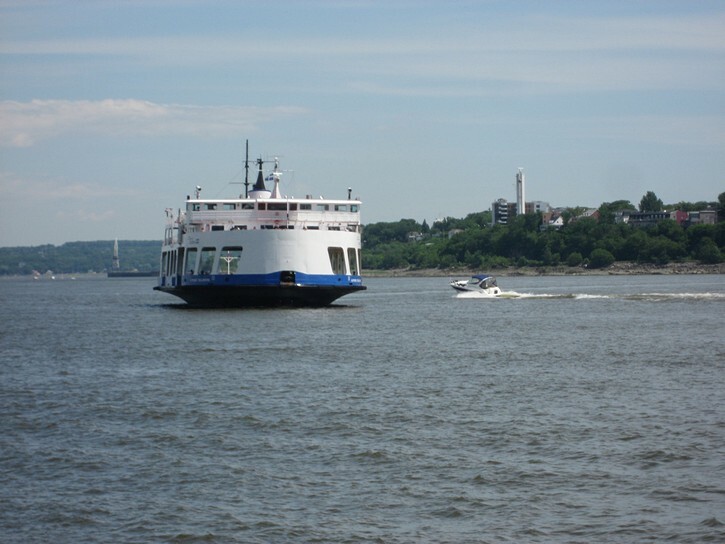 If you start this ride from Quebec City, you’ll have to make it down to the waterfront and take the ferry across the river to Levis. For information on how to do this, see the article on this web site about cycling around Quebec City. Once on the other side, you’ll turn left onto the bicycle path and head east. This path comes to an end in about 8 kilometres. Here you find is a gazebo, some outhouse toilets, and a water fountain. If it’s a hot day, drink up and fill up your water bottles. 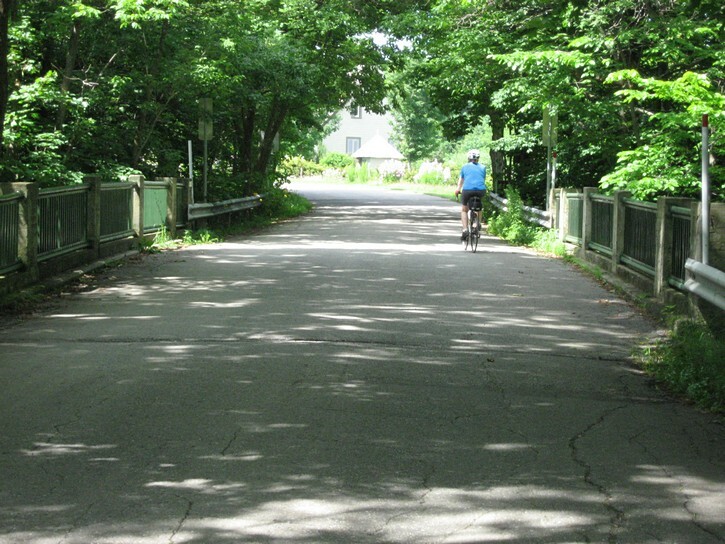 After the path ends, there is a bike lane which runs along St. Joseph for several hundred metres, which leads to Highway 132. 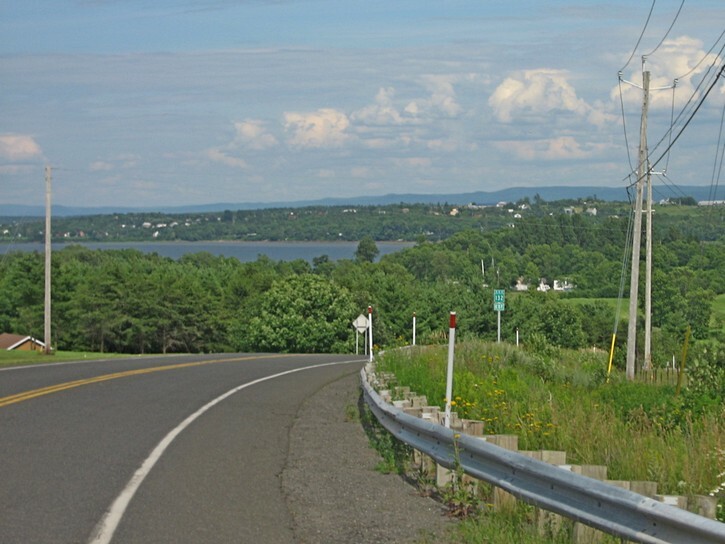 From this point onwards, you will be, with the exception of a few short detours, riding on the paved shoulder of the 132 all the way to Montmagny. The paved shoulder is about a metre wide. For the first half dozen kilometres, this shoulder is beginning to show its age, but it’s still ride-able. There will be a noticeable improvement in the quality of the paved shoulder later on. While there are a few spots where the 132 can be a little busy, all the heavy traffic is drawn to Autoroute 20, a major four lane highway which runs through an area a little further south. 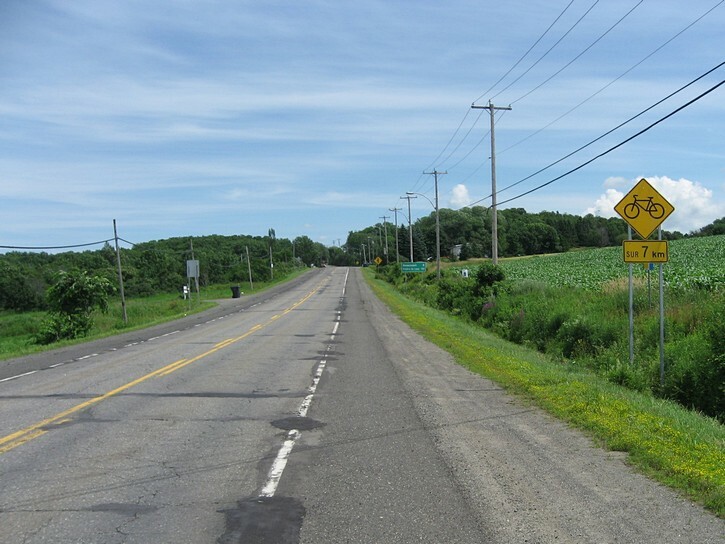 When riding along the 132, it is a good idea to keep an eye out for relatively small “Route Verte” signs that direct cyclists off the highway onto quiet side roads. These usually lead to through small villages, and they are worthwhile detours that do not add much distance to your ride. The first of the small villages you’ll encounter is Beaumont. It’s a picturesque little town with a creek running through the middle of it. In addition to the requisite regular-size church, it has two miniature churches (which are used to display paintings). 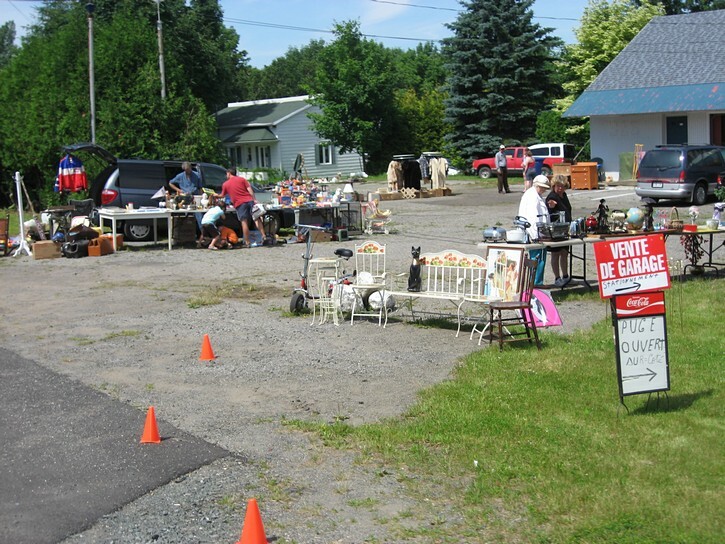 Saint-Michel-de-Bellechasse is another town you’ll want to check out. 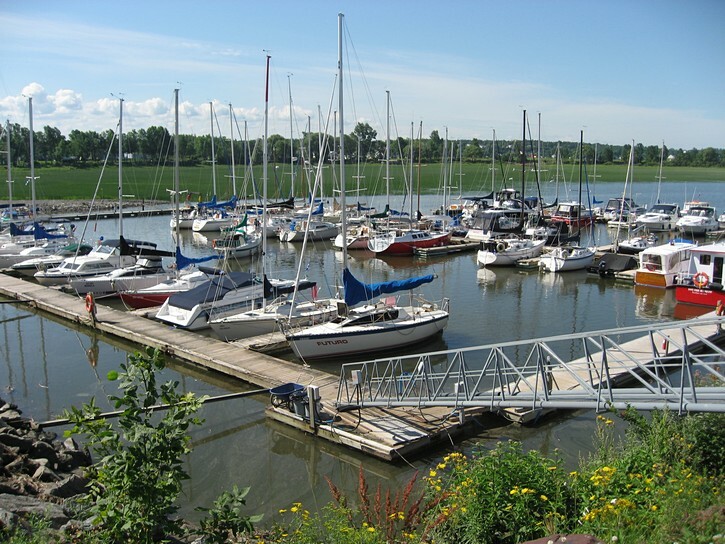 It provides waterfront access with a pier that jets out into the St. Lawrence River. 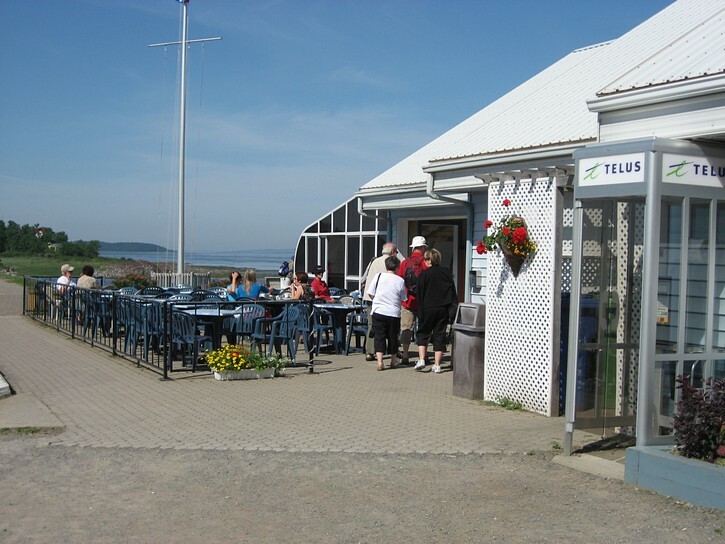 It also has a small grocery store, a little ice-cream parlor (complete with patio) and a bar (and possible restaurant) next to the marina. 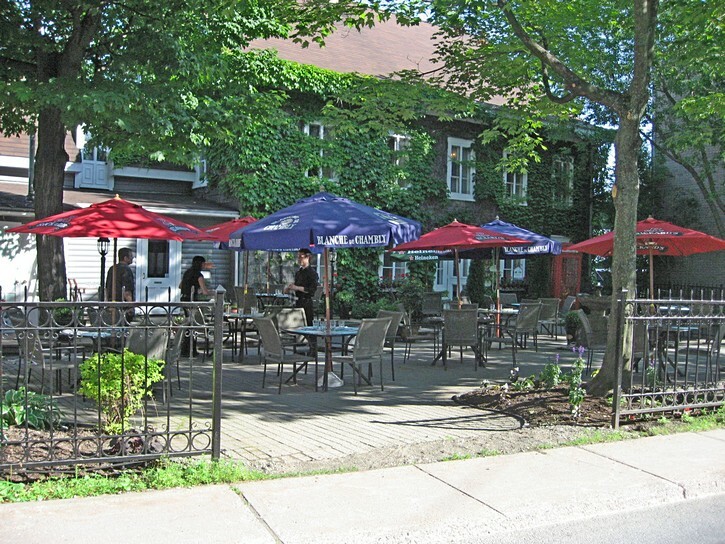 Saint-Michel-de-Bellechasse is also home to what appears to be a fairly nice restaurant, but it is located on the 132, so you’ll miss it if you take the detour through town. 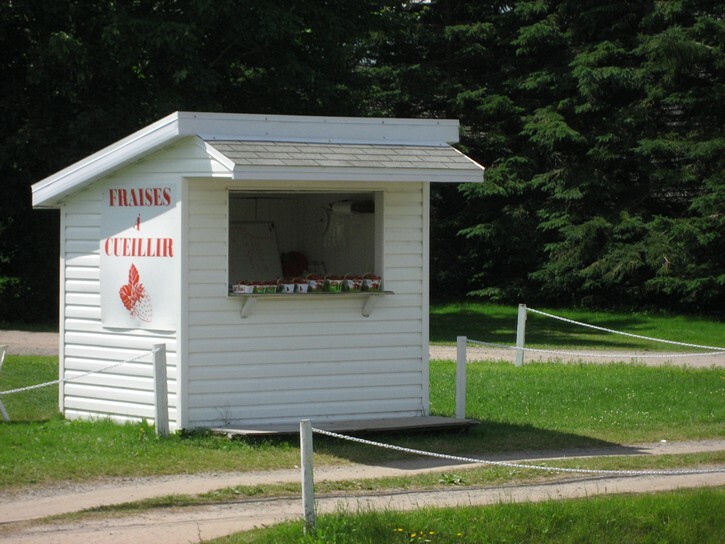 About four kilometres after Saint-Michel-de-Bellechasse (and before the village of Saint-Vallier) you pass by a rest stop and ecological interpretation centre on the left side of the road. 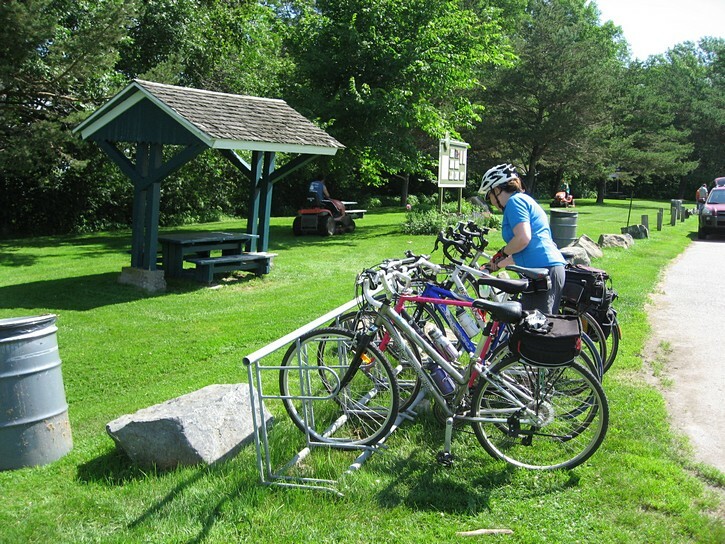 It has public washrooms, a bicycle rack, and some picnic tables. 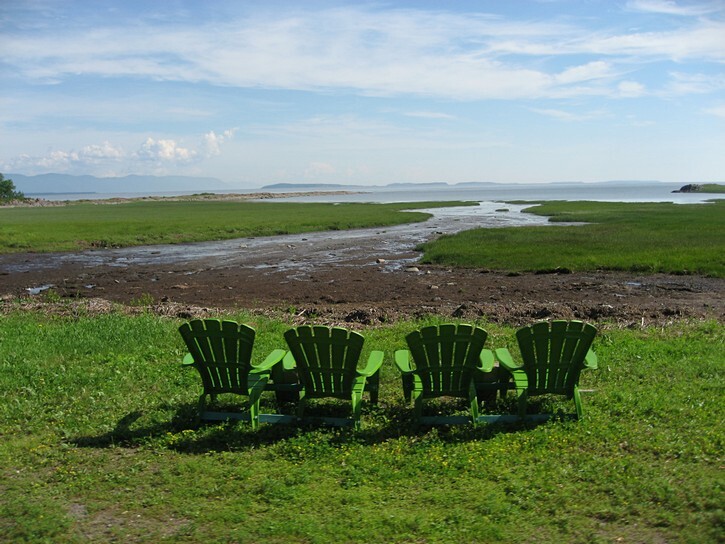 However, the real reason you want to stop here is that if you stroll down one of the foot paths, you’ll be rewarded with an impressive view of the St. Lawrence, especially at low tide. As you to head further east on highway 132, you come to of top of a hill (between Saint-Vallier and Berthier-sur-mer) which will provide a dramatic view of what that seems to typify this ride. 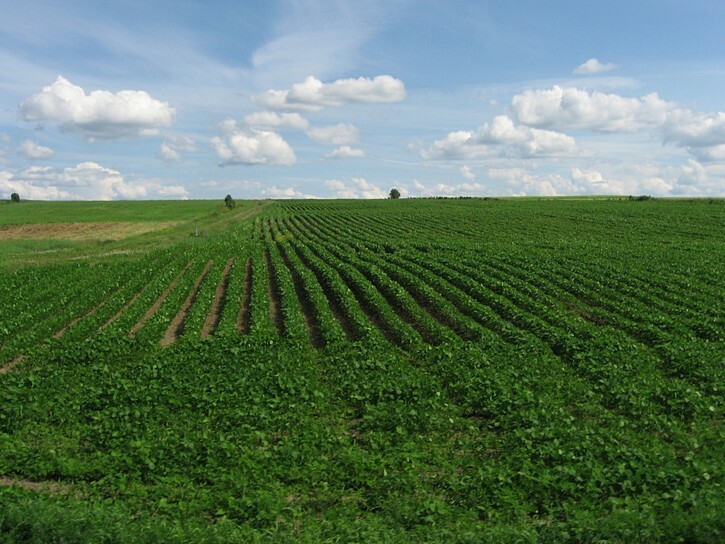 On your right will be large rolling farm fields, and far-far in the distance, the Appalachian Mountains. 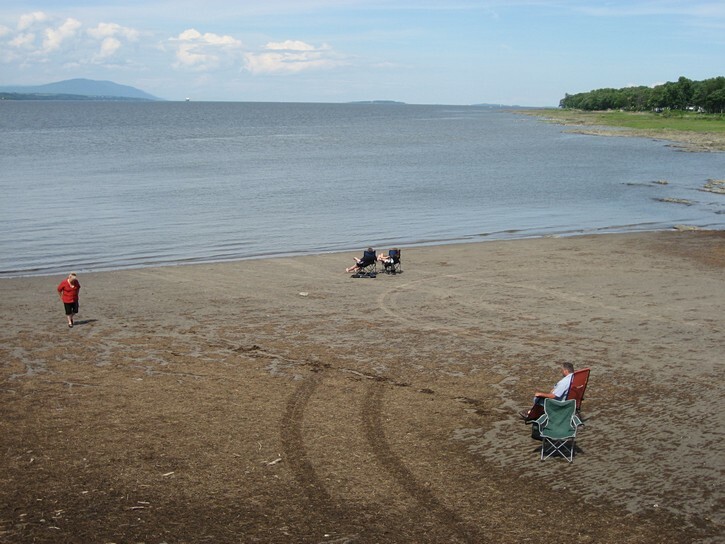 On your left will be a great view of the St. Lawrence with the Laurentian Mountains in the background. This one scene seems to capture the very essence of the St. Lawrence valley. You’ll probably want to drop in on the small village of Berthier-sur-mer. 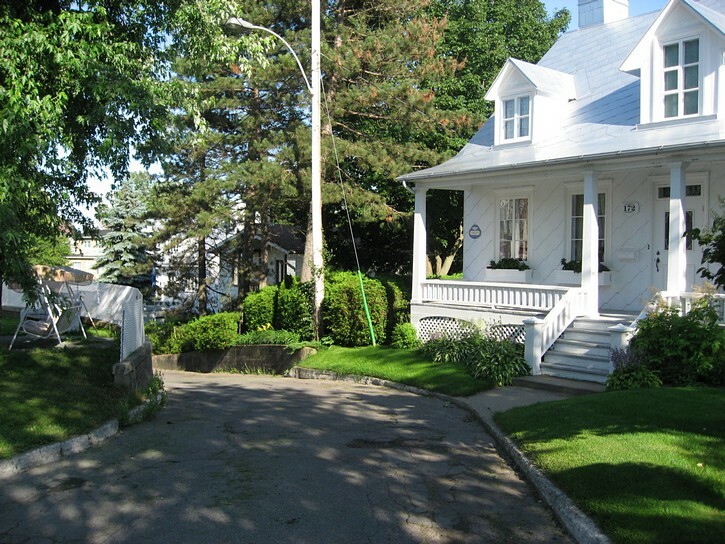 A fair number of tourists pass through this town because its dock provides waterway access to the Grosse Île National Historic Site. 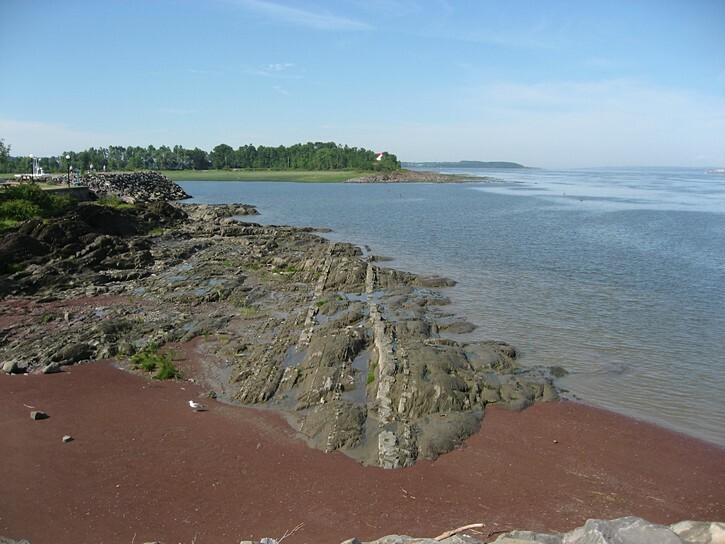 Grosse Île is an island in the middle of the St. Lawrence River. It was a quarantine station for would-be immigrants to Canada in the 1800s, and it has particular significance to many people of Irish ancestry. Today, it is the site of one of the more important memorials in North America marking the waves of Irish immigration that started with the potato famine. Many of the Irish never survived the harsh conditions of their trans-Atlantic crossing, and as many as 5000 are buried on this small island. A visit to Grosse Île may seem like a good idea, but there are two disincentives for doing so. First, the cost. The fee is $46.50 (as of 2010), although this includes the boat trip, admission ticket, and guided tour. Second, a visit and tour of the island requires at least four hours. 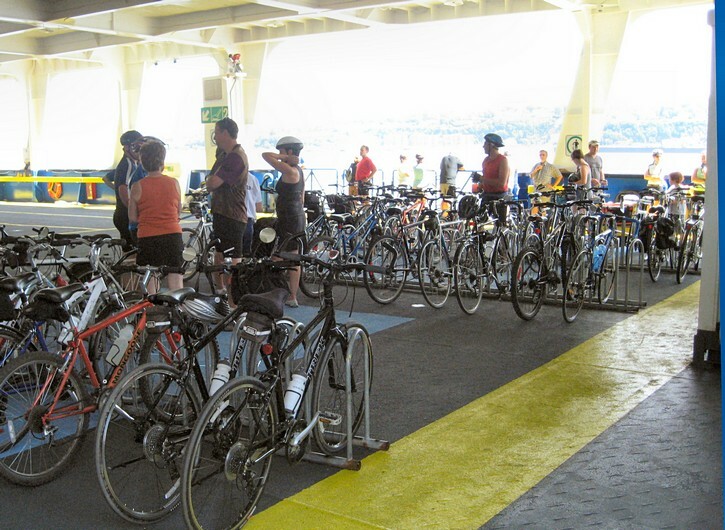 This is difficult to squeeze into a bicycle ride, unless you have decided to spend some extra time in the area. 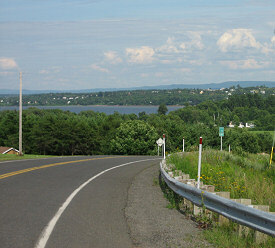 From Berthier-sur-mer it’s a little over 12 kilometres to Montmagny. 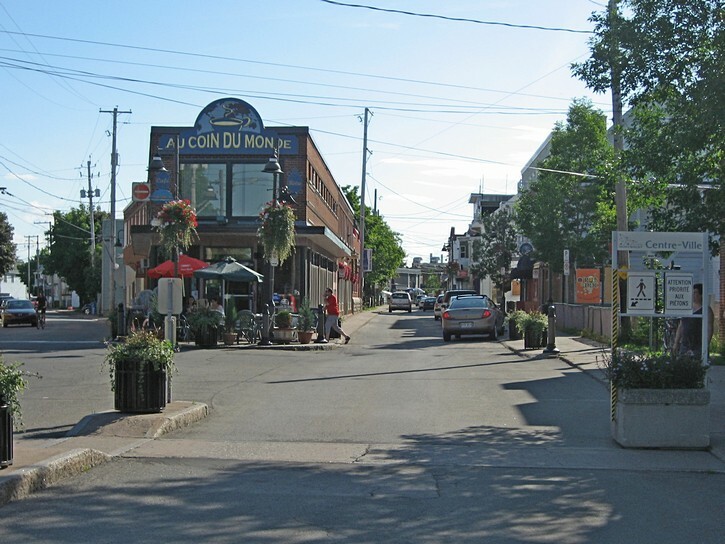 Once in Montmagny, highway 132 becomes a commercial strip with the usual shopping centres, restaurant chains, and nondescript motels. 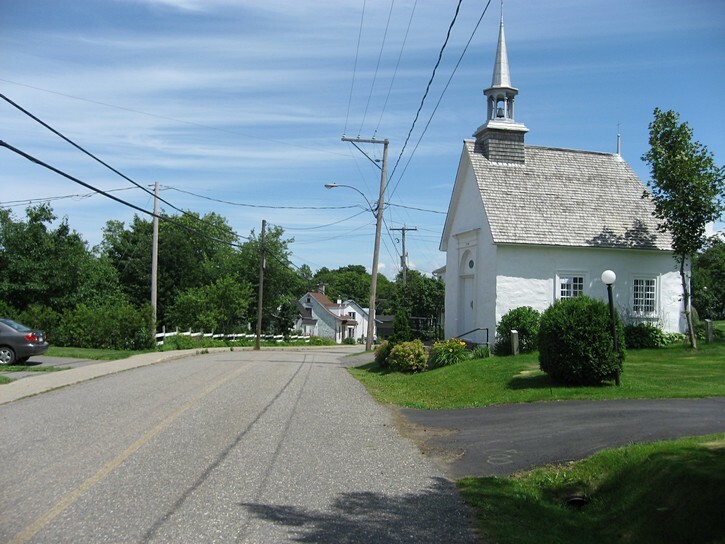 To get to Montmagny’s small downtown area, turn right on Avenue de la Fabrique, or simply head towards the church steeple (it’s visible from the 132). The downtown area is located about one block in front of the Church. 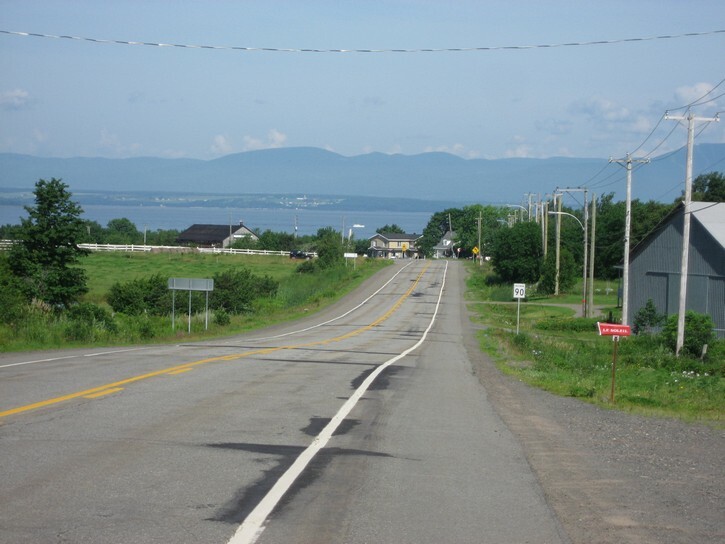 If you continue on the 132 a little pass the commercial section, you see a sign for the ferry that runs between Montmagny and l’Isle-aux-Grues (an island with a very small farm community). 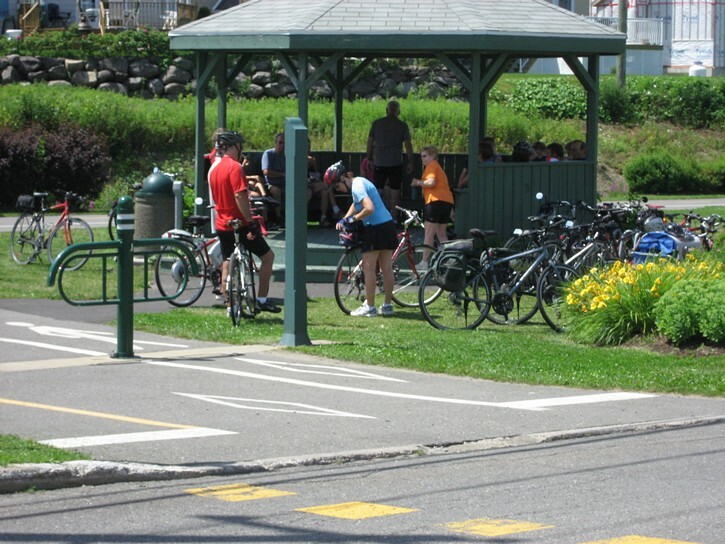 There is a tourist information office, nice park area, and some interesting bicycle paths in the vicinity of the ferry terminal in Montmagny. 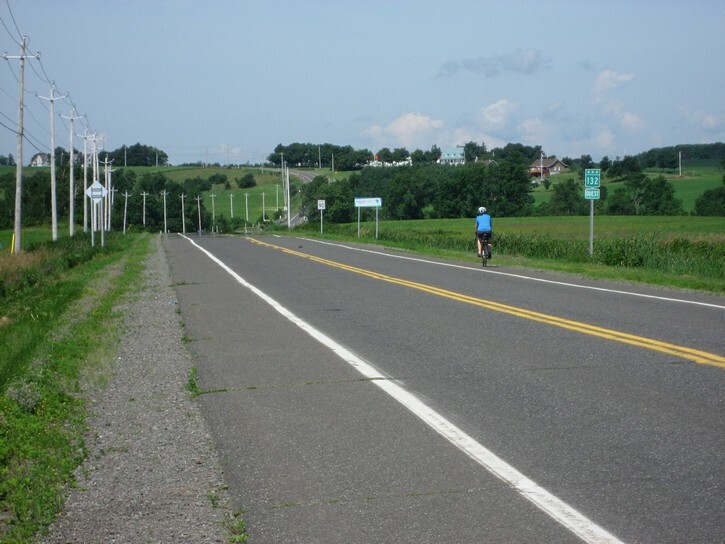 If you enjoyed your ride to Montmagny, you could decide to continue cycling on the Route Vert east along the St. Lawrence River. 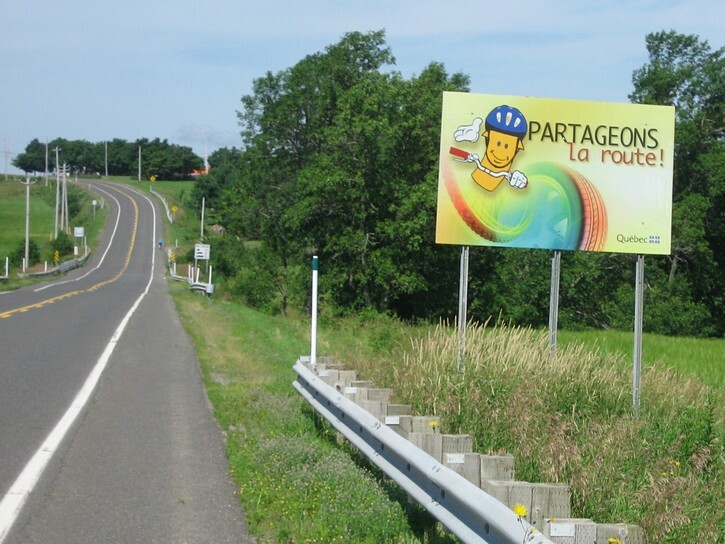 If you do, be aware that once get pass Saint-Jean-Port-Joli, there are some gaps in the Route Verte (i.e. the route runs on roads with no bicycle lanes or paved shoulders), and that you encounter some hilly terrain as you head further east. On the other hand, if you aren’t ready for this, or don’t have the time, you can simply head back to Quebec City after spending the night in Montmagny.